Auricular Medicine is a method of detecting and treating conditions using the ear. Auricular Medicine is a natural Chinese medicine used for thousands of years as an effective therapy. Auricular Medicine therapy can be used for both preventing and treating disease.The ear in Chinese medicine is considered to be in the shape of an inverted embryo. 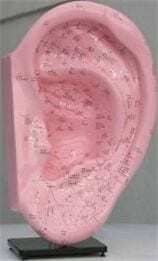 There are points on the ear which correspond to different parts of the body. The physician places plant seeds on specific points on the surface of the ear. These seeds are held in place by tape, allowing the client to continue to treat himself by pressing on the seeds to get relief of symptoms. Stimulation of auricular (ear) points can be used to improve the function of all the internal organs. Auricular Medicine therapy is also effective in helping people to lose weight and overcome addictions to alcohol and nicotine. Since all the nerves travel into the ear, this therapy can be used as a safe and effective treatment for nervous disorders and can be used on people of all ages. Merle Friedman completed advanced training in Auricular (ear) Medicine and has studied this Chinese Medicine discipline in depth with the world’s expert. Merle has worked with the world-renowned Chinese physician, Dr. Li-Chun Huang, for three years to develop her skills and deep level of knowledge. 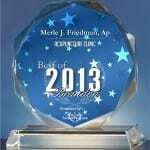 Merle Friedman was awarded the title Master of Auricular Medicine. Call (813) 381-3835 or email Merle Friedman to arrange an appointment for a non-invasive and natural Auricular Medicine therapy session. This treatment that has been successful with many patients.